Perfect place to relax, recharge, and experience panoramic sunsets along the Eastern Shore. Like our other locations, this newly acquired home provides comfortable scenic lodging for bridal accommodations and/or a corporate, family, couples, guys, or gals retreat. Seas the Day with this Stay. Call Donna today! 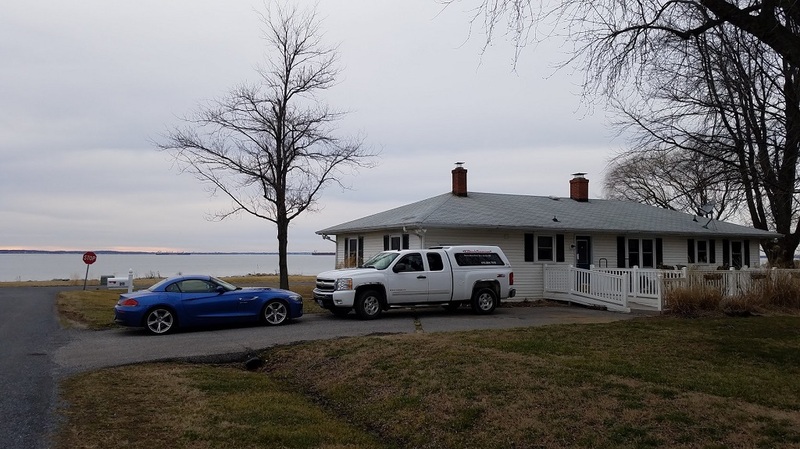 Astounding waterfront unobstructed views of the Chesapeake Bay including a front and back attached deck. Awesome kitchen, dining, and living area for the foodies in the bunch along with 4 King Bedrooms and 2 baths to sleep 8. Gaze at the famous Bay Bridge that separates Kent Island from the mainland and Annapolis. Suitability - Perfect for Family vacations, Girls Week, Guys Week, Reunions/Retreats, Golf outings, Water sport and nature enthusiasts, Fishing Parties, Weekend Getaways, Seminars/Workshops, Temporary Housing, Hosting your Midshipmen, and more. Four KING bedrooms and two walk-in showers. Great place for the wedding party to stay when getting married at Kentmorr, Matapeake, Elks Lodge, American Legion, Chesapeake Bay Beach Club, Maria's, The Inn/Knoxie’s Table, Queen Anne’s Marina/Silver Swan, Prospect Bay, Kent Narrows, or other local establishments. FREE on-site parking for our guests and room for you to bring your toys. FREE WiFi, Smart TV and sunsets. Central Heat/Air Conditioning, Water conditioner. Seasonal Fireplace. Washer/Dryer. Linen package provided for no additional charge. Hair dryers, iron, and ironing board. Full Kitchen with everything you need to cook including basic spices! Wine Rack and Glasses. Dishwasher, Stove and Microwave, Refrigerator, and more. Just bring the food, your paper and plastic products! Endless Entertainment – Two gorgeous decks, fire pit, gas grill, corn hole, and more. Easy access to Route 8 (Romancoke Rd), Route 50 and 301. Enjoy Queen Anne’s County where we Live, Work, and Play! Read our reviews on Airbnb and VRBO. Minimum age limit for renters is 25 years old. As a courtesy to our neighbors parties are NOT accommodated. Smoking is NOT permitted. Pets are NOT allowed, but there are nearby places that your pet can have a vacation too. Location, BAYcation, STAYcation! Our homes our located on Maryland’s Eastern Shore on Kent Island in Stevensville MD 5 miles from the Chesapeake Bay Bridge, 20 minutes to Annapolis, 30 minutes to Baltimore, 40 minutes to Easton, 45 minutes to DC, 50 minutes to St. Michaels, 2 hrs to Ocean City, and just around the corner from all the wedding hotspots. Shopping - Consignment shops, Dollar Stores, Kmart, Specialty Shops, Queenstown Prime Outlets, and Annapolis Mall. Airports – Kentmorr, Bay Bridge, BWI Thurgood Marshall, Easton, Reagan, Dulles. Beaches – Kentmorr, Matapeake, Sandy Point. Historic Stevensville first Saturdays. First Friday Gallery Walks in Easton and Chestertown Farmers’ and Artisans’ market. Kent Island Federation of Art (KIFA); Easton WaterFowl Festival. Hunting and Fishing - Chesapeake Bay Fishing Charters and Cruises. Romancoke, Matapeake, and Kent Narrows Fishing Piers. Canoes, sailboats, paddleboards, and kayaks for rent. Golf Courses – Blue Heron, Hog Neck, Queenstown, Prospect Bay. Recreation and Parks including Kent Island Trail, Cross Island Trail, Chesapeake Exploration Center, Chesapeake Bay Environmental Center (CBEC). Bars, Restaurants, Wineries and Distilleries. Other Activities and Local Amenities include Airplane and Helicopter Rides, Antiquing, Barber shops/Beauty shops/Massages/Salons/Spas, Bird Watching, Boat Shows, Bowling, Car Shows and Races, Casinos, Clubs-Elks/Legion/VFW, Charter Boats/Booze Cruises,/Island Tours,/Lighthouse Tours, Colleges, Dancing, Dock Bars, Sports Pubs, Crab Houses, Ferries, Fitness Centers/Gyms, Hiking, Hospitals, Running, Kayaking and Canoeing, Kent Island Taxis, Jetty Bus, Libraries, Live Music/DJs, Local History, Horseback Riding, Movies/Theatre, Museums, Senior Centers, Sightseeing, Yacht Clubs, Chamber of Commerce, and more.